Size: 9.3" x 9.1" x 2.7"
Compare this calculator with it's direkt predecessor, the TI-5040. The differences are marginal, instead 10 digits of resolution the TI-5220 displays and prints with 12 digits. Further enhancement is given with the 00-key to enter hundreds and the GT (grand total) feature. Dismantling the TI-5220 reveals some well-known elements, e.g. the printer assembly from the PC-100 printing cradle and two a TMS1309 resp. TMS1372 Single-Chip Microcontroller based on the famous TMS1000 core. The featured calculator was manufactured in Italy for the European market and is powered with 220 volts. 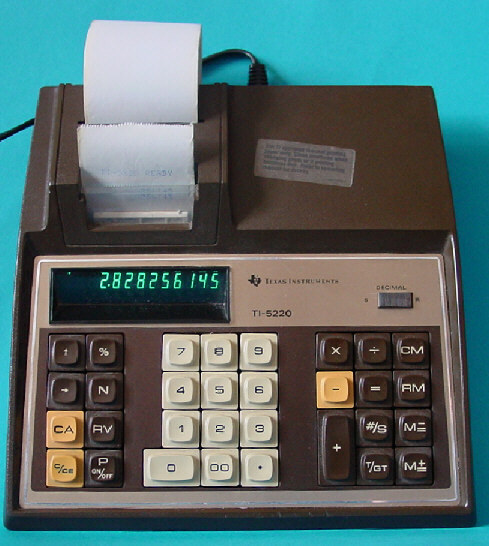 A desktop calculator with 12 digits capability using normal paper was introduced with the TI-5142 some years later. Don't miss the really big TI-5225 introduced in the same year.